Glasgow had long been on my bucket list and although we traveled extensively throughout the U.K. during the years we lived in London, we'd never been there. I wanted to see more of the work of Charles Rennie Macintosh, but I was also interested in the area as it once was a major weaving center. Call me a fiber art aficionado, a fiber geek, or just plain curious, I love well-crafted textiles. In addition to simply admiring them, I want to understand who made them and how they're made--whether they were made last week or 1,000 years ago. I own some wonderful textiles and love to wear them. Many were special gifts. Among them is an antique paisley shawl, which was surely made in Paisley and accompanied a Scot or English woman immigrating to America many years ago. Paisley, the center of paisley shawl production, is near Glasgow, but that industry is long gone. 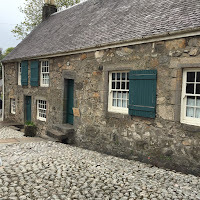 However, a little further west in Kilbarchan the National Trust for Scotland has preserved a The Weaver's Cottage much as it was 200 years ago. There are plenty of period homes of the rich and famous, but few that offer as pure a view into the lives of ordinary people as the Weaver's Cottage does. No kitsch. No sugar-coating. The cottage was built in 1723 and lived in continuously until 1953. The National Trust acquired it the following next year. Some of the furnishings, including samplers, belonged to the family. The steep stairs and hollowed out floors bear witness to many footsteps over many years. The loom, which is in the lower level, is not original to the house as the last resident had closed off the space allowing the loom to deteriorate beyond repair. In 1957, the loom of one of the last weavers in the village, William Meikle, was moved to the cottage. 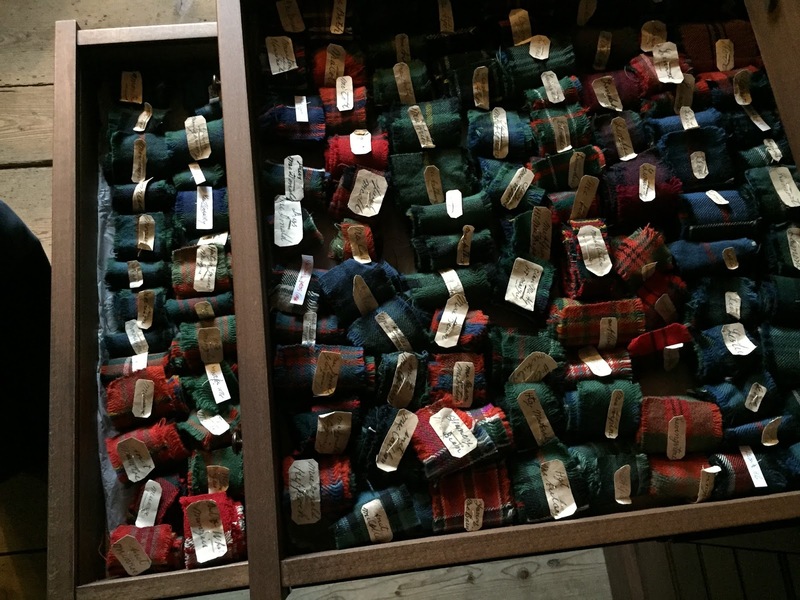 In the mid-20th century, Meikle wove most of the tartan samples in Cottage's collection, which fill many drawers like the one above. Kilbarchan was the center of weaving for nearly 200 years. 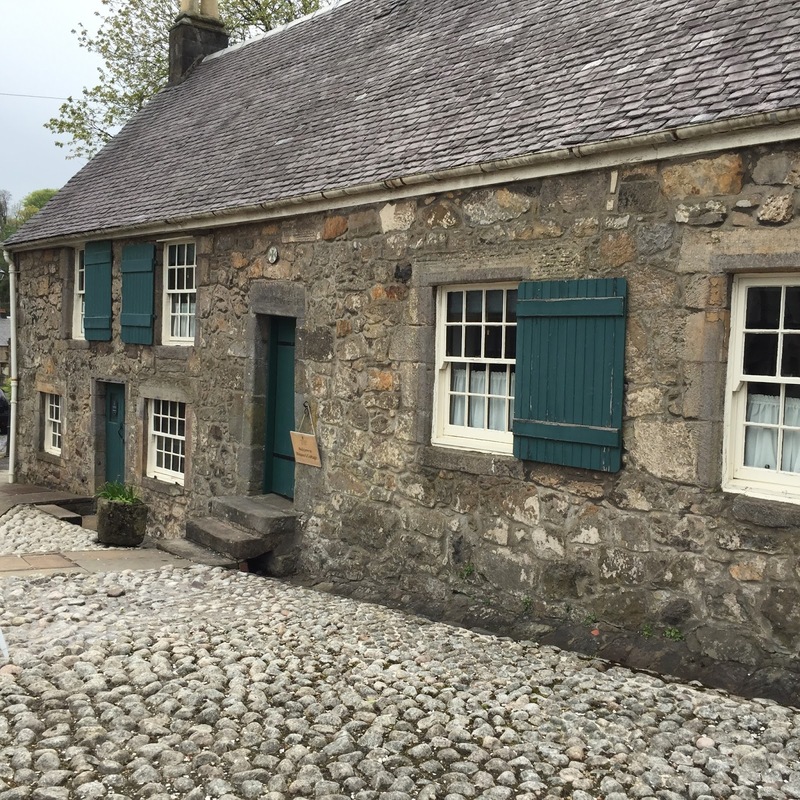 According to Weaver's Cottage history, the peak was in the 1830s when there were 800 handlooms in the community. When power looms in nearby towns undercut the Kilbarchan handweavers market, the weavers turned to plaids and tartans. 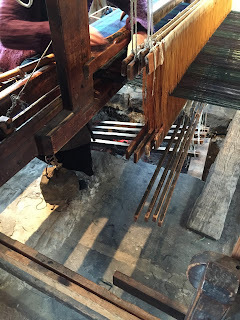 Even so, by the 1930s, only 20 handlooms remained in the village. I found the cottage remarkable. I appreciated the yarn-related equipment throughout the house--yarn swifts, skein winders, and spinning wheels, both big and small--but I loved the big, hulking, old four harness fly-shuttle loom. It isn't fancy, nor does it appear to be any more than what it is--a functional workhorse. 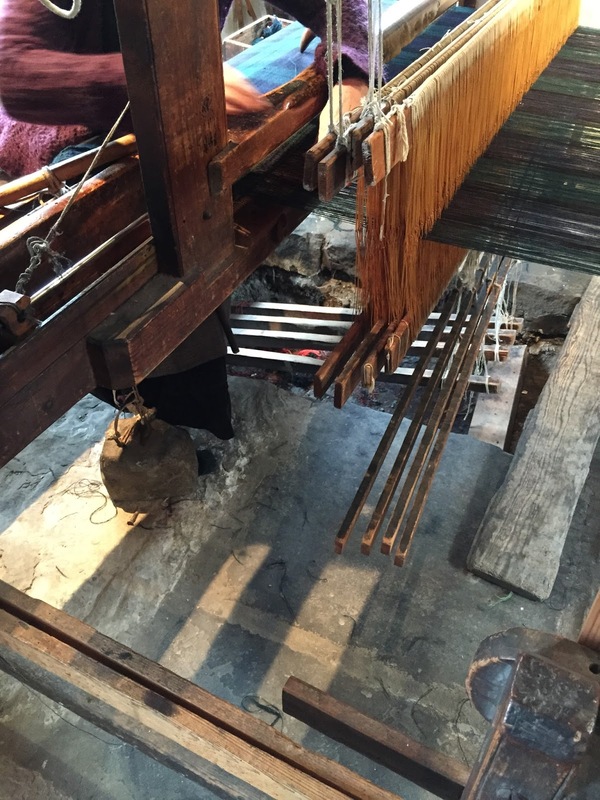 The loom was made for production weaving and its owners used what was at hand to keep it in working order. I particularly liked the curling stone weights. The ceiling is low. To accommodate the loom, a space was dug in the floor to accommodate depressed treadles--a common practice for cellar looms. I also enjoyed talking to Christine MacLeod, manager of the property, who provided a wealth of information. A Kilbarchan native, her primary interest is historical textiles. In the garden in back grows madder, dyer's greenweed, rhubarb, and woad, among others, for dyeing. And I envied her her job. The day we visited, Ms. MacLeod had a Black Watch pattern on the loom. She is also is a designer. Her recently designed Battle of Bannockburn tartan commemorates the 700th anniversary of the battle and is a beauty. She uses Gardiner Yarns for her historical weaving. 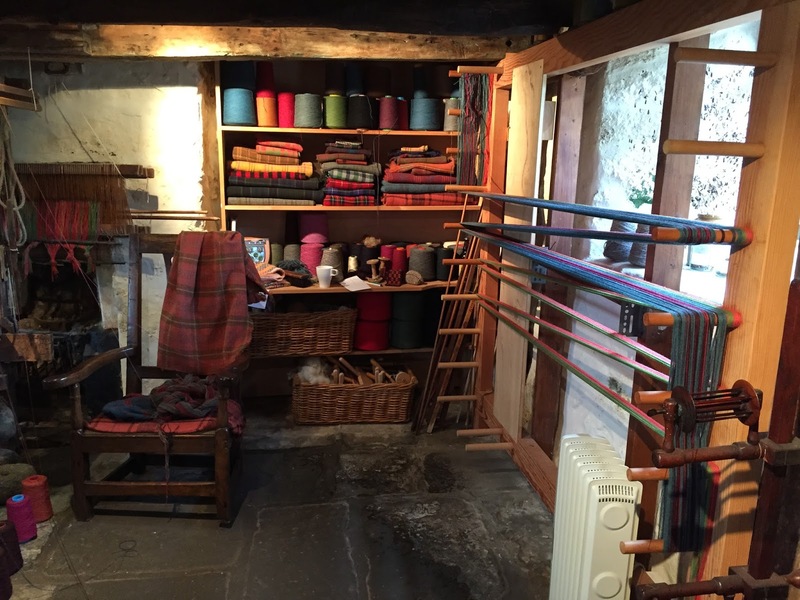 Teaching is also a function of the Weaver's Cottage, so a modern Louet loom is set up opposite the old loom for interested visitors to try their hand at weaving. 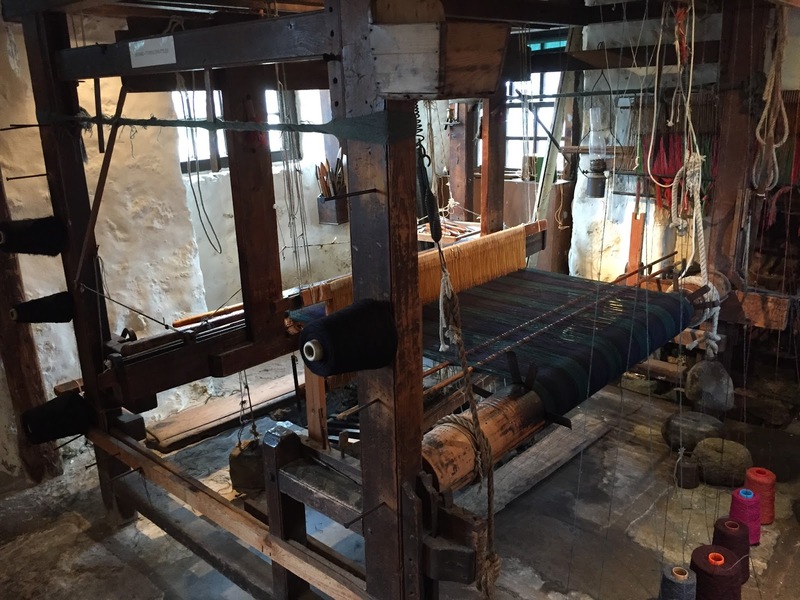 That loom is set up with wool from New Lanark Wool & Textiles mill where the yarn is still spun in one of the historic mills from organic British wool by traditional methods. All proceeds from the sale of their yarns go toward care and development of the New Lanark World Heritage Site. From the bedrooms to the garden to the loom room, this cottage does not aspire to greatness. And yet, 'great' is exactly how I would describe it--at least for me. It was a home of people--people with names and faces. In fact, at one time, it was three cottages. And It included a workroom that provided a living for families. It is as close to 'tasting the time' as I can get. And there is another aspect to the visit that will stay with us. The volunteers at the property are not only informative and committed, they go beyond usual volunteerism. Thank you, David Baillie, for so kindly and graciously helping us get back to Glasgow.